Opponents of abortion never believed the Clintons. Now, after receiving the first ever presidential endorsement from the nation’s premier abortion provider — Planned Parenthood — she is giving us further reason to doubt as she and her party push to require taxpayers to fund elective abortions until the day of birth. By definition, fundamental constitutional rights cannot be “rare.” They are to be freely exercised by all Americans freely. They are embedded in our Bill of Rights and represent the core of American liberty. The freedoms of religion and to vote, freedom of the press, the right to petition our representatives for a redress of grievances, and others are all fundamental rights specifically found in our Constitution. If the right to free speech was “rare,” there would be no Facebook or Twitter. Newspapers wouldn’t exist. Jon Stewart and Bill O’Reilly would be street sweepers instead of leading media influencers. Likewise, to make freedom of religion “rare” would require the closing of churches, mosques, and synagogues. After all, to be “rare” access to this freedom must be severely restricted. The same applies to all of our other cherished constitutional fundamental rights – freedom to peacefully assemble, freedom to vote, right to bear arms, freedom of the press, etc. Unlike these human rights embedded in the Bill of Rights, abortion is not mentioned in the U.S. Constitution. Rather, it was invented in 1973 by the U.S. Supreme Court, and unlike real rights, acting upon abortion inherently restricts the rights of other persons — specifically the unborn child by ending his or her life. As such, it can never be considered a fundamental right. And does Clinton really want abortion to be rare? A basic economic principle is that if the government wants more of a particular activity, it will subsidize it. By desiring to force taxpayers to pay for abortions, Clinton and her party are creating a policy that, if implemented into law, will increase the numbers of abortions in America. Clinton has never been asked to acknowledge these obvious and uncomfortable contradictions in her decades in the public eye. Perhaps in 2016 she will finally be asked by a reporter or even a debate moderator to explain herself. If asked she will most likely resort to typical “Clintonspeak” in an attempt to have it both ways. 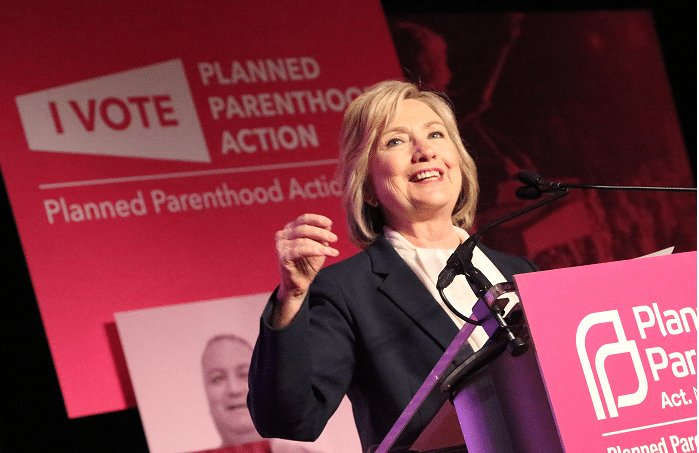 In the end, however, Clinton will never be able to satisfactorily explain why abortion should be “rare” while at the same time she and her party aim to force taxpayers to make it more common than ever.